Microcomposite LLC shares its case study of using Altami Studio software and SM0745 stereoscopic microscope for surface analysis of metals and semiconductors treated by compression plasma flows. One of the main duty of Microcomposite’s laboratory is the treatment of materials by new type of plasma flows known as compression plasma flows. This is high-energy treatment, which leads not only to the melting of the surface of the material, but also makes pressure on it to intensive mixing the surface melt which crystallizes quickly after the termination of the treatment (Fig. 1). One of the main problem encountered by the lab was the examination of a very rough surface of the sample, which is formed by plasma treatment (Fig. 2). The idea was to learn how to control the relief and its structural features. At the same time, it is most often necessary to estimate the surface relief not locally at high magnification, but integrally over the entire surface of a sample with typical 1 cm length. Obtaining the data about the relief was difficult with conventional microscopes, as many such microscopes do not provide a three-dimensional image while more advanced metallographic microscopes usually have excessive min magnification for this purposes. This is why the lab has purchased the СМ0745 stereoscopic microscope which perfectly performs in the research of the relief. The magnification range of СМ0745 microscope varies from 2.59 to 270 times which is ideal for the task. It allows to examine the surface relief for the entire sample as a whole, as well as to check in more detail the areas of interest and to determine those that will be further examined using scanning electron microscopy. This significantly saves labor and time to obtain high-tech data. In addition to the stereoscopic microscope, the lab has purchased a digital eyepiece camera that can be integrated into the microscope and used to record the results to computer. In practice, the camera does not provide a three-dimensional image, but a flat one, also the quality of images is not always good in standard lighting. So, the lab has installed Altami Studio software which allows to calibrate the equipment, automatically detects the camera and provides tools for measuring the size. The most valuable from Altami Studio for relief research is a feature for applying various filters to the image on the spot. This ensures the good quality of the photos. The figure below shows a photo of monocrystalline silicon sample obtained using Altami Studio that was before treated with compression plasma flows. It should be noted that this sample has very strong relief height differences. More over, the silicon as a material that reflects light well, is difficult to visualize in optical-range images. By applying a number of filters in Altami Studio the lab was able to distinguish the highly rough high areas (as whiter areas) from more flat ones (as dark areas), which allows to understand the flow of the surface melt during plasma exposure. 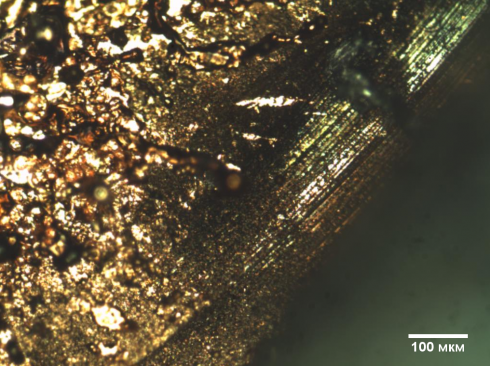 In the figure below, it was able to find not melted edges of the copper sample using a microscope and a digital camera, when treated by compression plasma flows. Thus, the screening effect associated with the plasma flow around the surface was discovered. The image was very clear and informative. Altami UCMOS03100KPA digital camera plus Altami Studio software and CM0745 stereoscopic microscope working together allow to effectively and successfully explore and visualize a very complicated relief. The magnification could vary over a wide range, providing local overview of the sample relief and the observation of their overall structure. Altami Studio software is easy to use, and provides all the necessary tools for research, which is enough in one workflow to get an image, adjust its quality, and mark all the necessary dimensions, which is very convenient, while saves time and labor.